The destruction left by Hurricane Stan in the city of San Marcos, Guatemala. CRS donated food, clothes and shelter in response to the hurricane. The hurricane tore through Central America in 2005, killing more than1500 people, most of them in Guatemala. Stan hit in October, at the tail end of what farmers call “the hungry season,” as families eagerly anticipated the harvest. 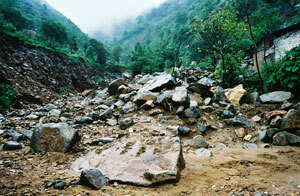 But the days-long rain wiped away crops, drowned livestock and washed away roads. A food crisis followed. Four years later, the experience is still fresh on the minds of people in San Marcos. “It rained for eight days, 24 hours per day. The rivers rose. In my village, we lost 27 houses. Eight people died in one house. We lost our entire crop—maize, beans, wheat—then we lost the potatoes to rot because of the water,” says 60-year-old farmer Efrain. Scientists predict that hurricanes will continue to become more frequent and intense as a result of climate change, turning a difficult situation into a dire one. In recent years, the frequency of climate-related disasters in the region has more than doubled. But tropical hurricanes are not the only concern. Windstorms, tornadoes, hail, heat-waves, gales and heavy rains are becoming more common. The impact is magnified in Latin America by the poor management and abuse of the natural environment. Farmers and agricultural experts in Guatemala say that weather in general is becoming more severe and unpredictable. The first rains come later and end earlier than previously recorded. For many farmers that means one annual maize harvest instead of two. Sometimes rains are concentrated in heavy downpours within shorter periods or drop out entirely for a month at a time. In the heavily deforested regions of Guatemala, poor soil management, steep road cuts and heavy rains conspire to trigger landslides every few days during the rainy season. Meanwhile, intense winds strip leaves and break stalks of coffee plants. Two years ago, a hailstorm damaged the maize and potato harvests. Sometimes the rain doesn’t come at all, wiping out entire harvests. Many farmers now talk about the absence of the “canicula,” a dry spell of up to ten days that traditionally falls in the middle of the rainy season. The short break from rain was important for keeping in check funguses that flourish under humid conditions. Area coffee bushes become stained yellow and full of round holes as diseases spread. How are people coping with these challenges? Migration, which has always been a coping strategy, is on the rise as farming families are faced with decreasing yields, rising prices and natural disasters. Many local farmers earn money as day laborers on nearby coffee and rubber plantations. Others trek to bigger cities, Mexico, or the United States in search of work. With help from Caritas and CRS, Oscar Bodines has worked to help his family and the forty neighbors in his farmers’ group adapt to these changes without leaving home. He has diversified his crops and implemented a number of soil management practices. In addition to bananas and coffee, he grows pacaya palms (Chamaedorea tepejilote) for erosion control on steep slopes. Often planted between rows of beans and maize, these palms grow several meters tall, have edible shoots and attractive leaves used for decoration at festive events. He also cultivates hoja de maxán (Calathea lutea), a native plant which tolerates heavy rains and whose large leaves are sold commercially for wrapping tamales. He grows green beans and tomatoes in his new greenhouse, and medicinal plants in a small kitchen plot. Rather than buying expensive and potentially harmful agrochemicals, he produces his own organic fertilizer from poultry droppings and his own pesticide from home-grown chili peppers.